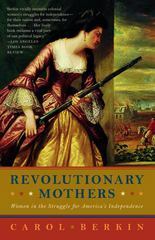 Revolutionary Mothers 1 Edition The American Revolution was a home-front war that brought scarcity, bloodshed, and danger into the life of every American. In this groundbreaking history, Carol Berkin shows us how women played a vital role throughout the conflict.The women of the Revolution were most active at home, organizing boycotts of British goods, raising funds for the fledgling nation, and managing the family business while struggling to maintain a modicum of normalcy as husbands, brothers and fathers died. Yet Berkin also reveals that it was not just the men who fought on the front lines, as in the story of Margaret Corbin, who was crippled for life when she took her husband’s place beside a cannon at Fort Monmouth. This incisive and comprehensive history illuminates a fascinating and unknown side of the struggle for American independence.